Talking to Myra LeBlanc about work and life in general, the expression "working on the front lines" comes up frequently. She loves being among people, problem solving, actively communicating. No shrinking violet, this woman. Myra gives 100%, as a mother, as a friend, as Tofino's dynamite postmistress. Myra arrived in our midst in April 1998 from Skidegate in the Charlottes. For thirteen years she had worked as a postal clerk in Queen Charlotte City. Following her Haida husband's death, she felt she had to see more of the world, be less isolated, so she competed for her present job. "We Tofino-ites are the lucky winners," I suggest. Modestly, she admits to lots of positive feedback, to people telling her, "You've made a difference here, Myra." Proof of this is a plaque hanging in the post office acknowledging the staff placed among Canada Post's top three in 2003 for the British Columbia "Team of the Year" award. First Nations people let Myra know that it's comforting to come into a place where a person with First Nation links is working, Myra's family being part Mic Mac, part French Acadian. I want to know what relieves the constant pressure of getting the never-ending job done at the post office. Myra has told me that dealing with the mail for 600 people on General Delivery alone is demanding. "Sometimes," she says, "people are waiting right at their box, and grab the mail right out of the postal clerk's hand." Myra can dish out a few surprises herself. When she sees friends come in, she sticks her closed hand right in their box, and when they open she makes her hand do a Boo! Then she relates an anecdote, which demonstrates Myra's sense of humour and sympathetic way. "Alf Jensen was in Mexico some time back. He sent a postcard, care of General Delivery, to "Clementine", an eagle that was a regular visitor to his home. I remember looking at that postcard and thinking, 'Only in Tofino do eagles get postcards!' " Some time later when Alf was recovering from an illness, Myra acted as personal correspondent for "Clementine", carrying on a correspondence with Alf for a year. An account of this whimsical correspondence appeared in Pacific Express, the Canada Post newsletter. Though I know that Myra is well integrated into Tofino life, I ask her if she misses the Charlottes. "What I miss are the family and friends I still have there. Skidegate is a tight-knit village. It will always be home to me. And I miss the constant supply of sockeye and crab, because my husband was a fisherman." I kid her about leaving the Charlottes to be less isolated, Tofino not being exactly a Mecca at the center of the world. "Ah," she replies, "but I go out-of-town at least every other weekend, because I can!" A few questions later, I find out the Myra is an accomplished cook with a lot of experience. In fact, it's possible you could find yourself around Myra's dining table in the company of one or more of Tofino's finest chefs. I ask if there was anything she had dreamed of becoming. I had a hunch, because I knew about Myra's amazing professional performer sister, whose photo doing her Tina Turner impersonation has yet to be taped up somewhere in the newly renovated post office. "A musician," is her immediate reply, confirming my hunch. "My whole family is musical," she says, then describes family "shindigs". "I tried everything," she continues seriously, shaking her head, "took lessons of every kind. The only thing I can actually play are the spoons." We laugh. "And I'm not too shy to do karaoke," she adds. Myra LeBlanc found it amazing that the community accepted her so readily four years ago. We may have made her feel at home, but is she ours? Nothing lasts forever. There are hints that her show biz sister may tempt Myra away from us someday. Meanwhile, we have this dynamo on the front line, her friendliness good energy and teamwork making our Canada Post a place that offers more than just efficient mail service. 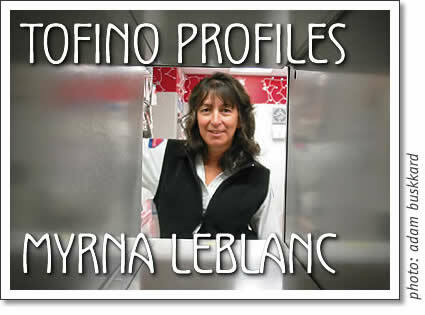 Tofino profile of Myra LeBlanc, postmaster of Tofino. Written by Shirley Langer for Tofino Time magazine in January 2004.